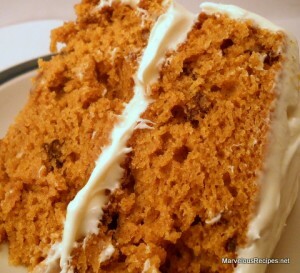 Even if you are not a big fan of pumpkin, you will truly enjoy this delightful cake. It has been a favorite of my family for many years. 1. In a small bowl, sift together the dry ingredients; set aside. 2. In a large mixing bowl, cream together the oil and sugar. Add eggs and beat well. Add pumpkin and beat until well blended. 3. Gradually add the dry ingredients to the pumpkin mixture, beating well after each addition. Stir in chopped walnuts. 4. Divide batter evenly between 2 greased and floured 9×1-1/2 inch round cake pans. ** Bake at 350 degrees F for 30 to 35 minutes or until toothpick inserted into middle of layer comes out clean. Remove from oven and cool in pans for 10 to 15 minutes. Turn out onto cooling rack until cold. 5. When cold, frost top of 1 layer with Cream Cheese Frosting or Coconut Pecan Frosting. Add the second layer and frost top and sides with the remaining frosting. Yields 8-10 servings. * When using canned, be sure to use canned pumpkin. Not pumpkin pie filling. **Can also be baked in a 13×9-inch baking pan, if preferred.